GOOD CONDITION ! Faire défiler l'annonce / Scroll. 100% polyester. - B = 72 cm / 28.34". Equipe de FranceVoir. FC Nantesvoir. Nos bureaux sont situés 3, place Jean Nouzille 14000 Caen. Id : 1461193637943. Date immatriculations RCS : 2018. SIRET : 840 635 395 00014. Raison sociale : THE FOOTBALL MARKET SASU. 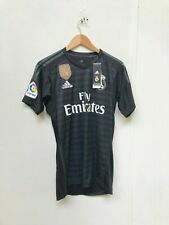 MAGLIA CALCIO DA PORTIERE DEL REAL MADRID PERSONALIZZATA CASILLAS 1. LA MAGLIA E' USATA MA IN PERFETTE CONDIZIONI. SPONSOR TECNICO: ADIDAS. Iker Casillas. TESSUTO FORMOTION invece del Climacool. Real Madrid | Nazionale Spagnola. STEMMA REAL MADRID STAMPATO e non cucito. Maglia Portiere Adidas Match Worn. STRISCE ADIDAS PIU' LEGGERE. MATERIALE MAGLIA PIU' LEGGERO. Features I.Casillason the back of the shirt. Size: Small.